The Big One: the world's highest mountain, 8,850m of striated rock, ice, tumultuous falling glacier, unblemished snow, jagged ridges...and dead bodies. An ultimate target for most serious walkers, albeit tarnished by too many visitors. Stunning scenery all around in what is the absolute heart of the Himalayas, with many variations that enable you to escape the crowds on the best known trails and get up to miraculous viewpoints. Tough but marvellous walking on the Nepal side. While Everest and its base camp have semi-mythical status, there is actually better, more rewarding walking (better views of Everest, even) to be had elsewhere than on the grind to base camp. Great walking on the Tibet side, too. The fact that you can drive to Rombuk monastery makes for day tripper visitors in the "main" base camp area, which isn't that great for the atmosphere. But exceptional walking in superb and completely empty mountains elsewhere, including to the Kangshung base camp. These are tough walks in high, remote, capricious mountains, on which you will have to be self-sufficient and where altitude can cause real problems. Come prepared, and acclimatize properly. Tough but marvellous walking on the Nepal side, with many variations that enable you to escape the crowds on the main trails and get deep into some of the world's most miraculously beautiful scenery. While Everest and its base camp have semi-mythical status, there is actually better, more rewarding walking (better views of Everest, even) to be had elsewhere than on the grind to base camp. Great walking on the Tibetan side, too. See below. Some of the world's most beautiful mountains, and best trekking, in this World Heritage Area - and you can do a lot of it using teahouses, so no need for huge packs or a big entourage. The area is accordingly popular in high season, so less pristine than other parts of Nepal. The delightful sherpa people are themselves a living highlight. Everest Base Camp is of course the best known walk here (14 days), which should take in the viewpoint at Kala Pattar (as BC does not have an Everest view). The atmosphere is reduced by the number of visitors, but you can get away by adding side trips, or creating a circuit via the Gokyo valley (18 days total - recommended if time allows) and Thame. Despite the romance, Base Camp can itself be deeply disappointing, a crowded mess (although a lot cleaner since clear-up programmes have been instigated), so approach with some philosophy. You don't HAVE to go the whole way there, and alternative walks can be preferable as described below. But Base Camp does not have to be your - or your only - destination. You can visit the near-miraculous Gokyo Valley (12 days, 18 as part of Everest circuit), with its magnificent lakes below Chu Oyu (great day walk to base camp), getting outstanding views from the passes of a sweep of huge peaks and glaciers (the Renjo La to the west of Gokyo is said to have perhaps the best views in the whole area). 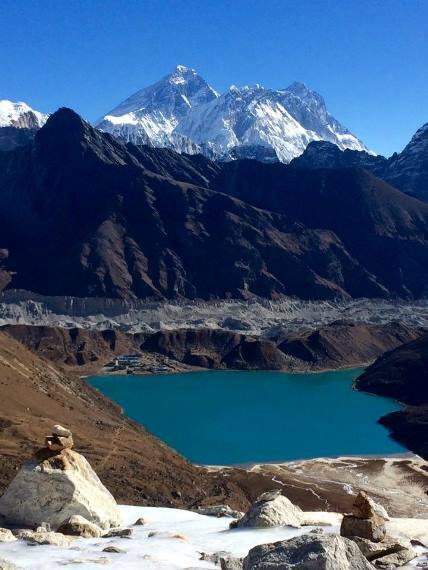 Gokyo Ri (5483m) is a great day-walk trekking peak. You can circle to or from it as part of an extended Everest trek. The Bhote Kosi Valley area, west and north of Tame, is also superb, and less visited, mainly as an acclimatization side trip from Namche Bazaar by those passing the lower reaches on a Gokyo/Everest circuit those on the Three Passes trail. An outstanding walk would be to head north from Thame and cross into Gokyo over the Renjo La, and then on over the 5,420m Cho La to the Khumbu Glacier and thence on to Everest Base Camp. (This is the larger part of the Three Passes trek, but in reverse) Around 17 days from and back to Lukla. The Chukhung Valley and Island Peak,to the east, is fabulous walking and leads to Island Peak (6189m), Nepal's most popular trekking peak. Shivalaya to Lukla or Namche Bazaar: the old walk in before the landing strip was built at Lukla. Lush countryside, friendly communities and almost no visitors in these lovely "lower" areas. An excellent six day acclimatization walk. Peekye Mountain is in the foothills (at 4,070m), with superb views of the grand range and (relatively) gentler (and certainly less altitudinous) trekking in forest and farmland, enjoying hill village culture and wondrous scenery. A range of walks can be made in this region. This pages rating is based on a Gokya/Everest BC circuit. Much less well known, but oddly more accessible than the Nepali side camps, are the north-face base camps in Tibet, which are a mere thousand metres or so higher than the surrounding plateau and. The Kangshung base camp is relatively remote and totally spectacular. The main base camp above Rongbuk Monastery can now be reached by minibus (you can guess the consequences). Despite this, the Everest views are stunning, and the high Rombuk monastery nearby has simple charm, so it is not to be missed if passing: but not as a special walk. Remember that the altitude can cause misery and even death. It will undoubtedly detract from your enjoyment, although most still think that a major walk here is a high point of their hiking lives. You don't HAVE to do this, and slightly lower-level treks can be more unsulliedly joyous. Allowing time for proper acclimatization is essential.